Sayuri is a crack Security officer from the Lagash system whose skills in cyber-warfare and conventional security tactics placed her on the fast track to a Chief of Security position. Her dedication to duty made her one of the last to ever be suspected of launching a mutiny. As the daughter of a formerly wealthy merchant family, her actions have undoubtedly led to her being disowned. 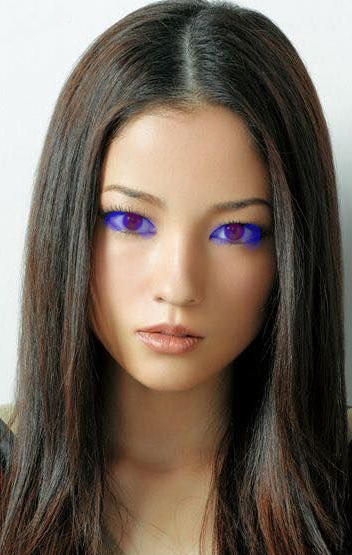 Her violet-within-blue eyes make her stand out in a crowd. Born on the Dance of the Dusk arcology on Lagash IV, Sayuri was raised in a middle-class merchant family who had fallen from fortune. The various upgrades she had received should have qualified her for success within her culture, but due to the outstanding debts of her family, she would have had to start from the lowest rung of society. By comparison, Starfleet was much more appealing. After graduating from the Academy with high scores, Sayuri entered service and distinguished herself in various conflicts. Her natural aptitude for security duties quickly placed her in line for a swift promotion and placement as security team lead, but her career stalled there. Between her philosophy of personal excellence and her Lagashi heritage, many of her colleagues kept her at arm’s length. The notorious Black Nagus organization approached her with a quid pro quo offer: in exchange for harmless data, reports, and other intelligence, Black Nagus assets within Starfleet would ensure that she received the recognition and advancement she deserved. Sayuri always told herself that she was given the Chief of Security post on the USS Chimaera due to her service record, but she could not deny the sudden change once her Faustian deal had been struck. On the Chimaera’s maiden voyage, Sayuri came across a communique which called for the capture of the Chimaera by Consortium and Black Nagus operatives. Realizing the gravity of the situation, Sayuri double-crossed the Black Nagus and Starfleet alike by executing a mutiny of her own. Not knowing who could be trusted, she assembled a skeleton crew who could help seize the ship and still keep it flying in restricted Dominion space. As a result, Sayuri has found herself a wanted fugitive of the Black Nagus, the Consortium, the Dominion, and Starfleet.